Mag-nificent’s mission is to enhance any event with our one-of-a-kind event souvenir that will leave a lasting impression for years to come. Attendees can get their photo taken by one of our professional photographers, snap a selfie with our smartphone application or even walk the red carpet in style. In any case, their photo will be waiting on a premium photo magnet within minutes! I worked with the Mag-nificent Instant Photo team for a professional networking event and they were AWESOME! Easy and professional to work with. They made the evening truly Mag-nificent! I HIGHLY recommend using them and look forward to working with them again soon! Mag-nificient came to a work Gala type event. They were so wonderful. They got so many good shots of everyone just hanging around and everyone loved being able to take the magnets home with them. They are currently sitting on multiple file room drawers, so we see them daily. Thank you! From large corporate expos to weddings we bring excitement and relevant memories to any event. 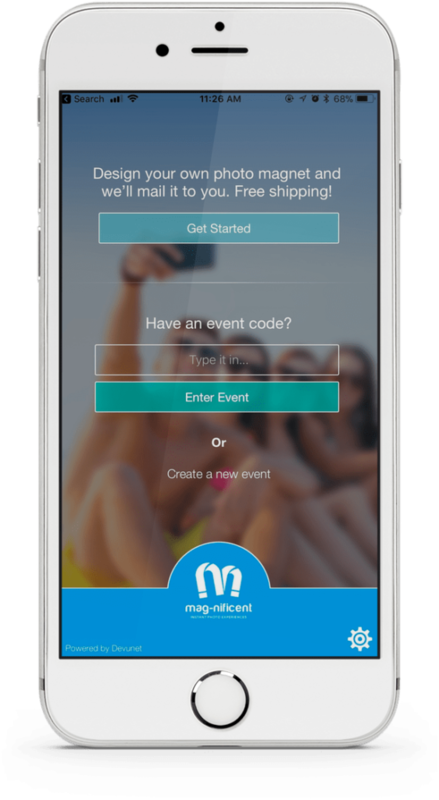 Get people generating social content and be tagged at your event Instantly! Check out everything our app can do! Get it only through Mag-nificent and it’s totally FREE!